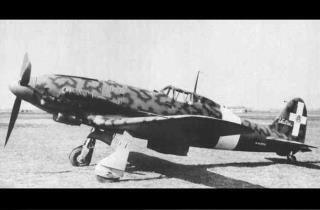 (Newser) – An Italian WWII pilot who died battling US pilots 70 years ago has been found 13 feet underground, his remains still at the controls of a fighter plane armed with machine guns and cannons, Discovery reports. Lt. Guerrino Bortolani went down in a losing battle against Allied planes on March 11, 1944, and hit the ground so hard that he literally vanished into the countryside outside Padua in northern Italy. "The crash site is now a cornfield," says a member of the wreck-hunting crew that found Bortolani. "We were able to find the remains with the help of an elderly man, who on that day witnessed the fighter going into a nosedive and hit the ground." Obviously others had scavenged the site decades ago and covered it up to hide what they'd done. No way the wings and every other part would have disappeared. i might add to be caught or even suspected of espionage the locals were often lined up and shot, killed.